This one has a Kmise Soapbar pickup. A cute Fiddle shape bass. Four strings. Very comfortable. Walnut body. 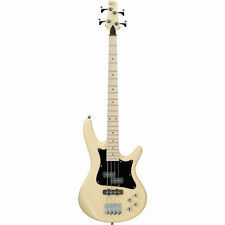 After over 2200 basses sold world-wide, we wish to make the following claim. "These are without a doubt the best sounding basses on this planet. WARMOTH PRECISION JAZZ BASS GUITAR. THIS BASS IS IN LIKE NEW CONDITION. ZERO FRETWEAR. IT HAS A SWAMP ASH BODY WITH AN OPEN GRAIN GOLD LACQUER FINISH. WARMOTH FACTORY FINISH ON THE NECK. THERE IS A BATTERY BOX ON THE BACK WITH A REMOVABLE COVER TO ACCESS THE WIRING FROM THE BACK. ◎ neck truss rod: You can adjust the neck, truss rod also has worked. The setup of a guitar base should feel easy in order to be its favorite. ・Soft Case. I am experienced in guitar maker service. There are aging scratches cracks and dirt, but there is no problem in operation. Color: 3TS. 80's FERNANDES RPB ’62. Frets: 80%. Weight: 3.2kg. Can't find what you are looking for?. Can't find what you are looking for?. Sorry for your inconvenience if that is the case. Aria Pro2 CSB-450 Black MIJ. Color: BLK(Black). Can't find what you are looking for?. Weight: 3.8kg. Body: Basswood. NEW Grass Roots / ESP G-AM-55MS. Fingerboard: Rosewood (White Binding & Block Position). Neck:Hard Maple. Number of frets: 22. Can't find what you are looking for?. 1987-1989 FERNANDES FRB-55. Can't find what you are looking for?. Sorry for your inconvenience if that is the case. Unless it will be very carefully bubble wrapped and put into a cardboard box. Nut Width: 39mm. Made in Japan in early 80s. Bridge: Die-cast bridge. The neck is slightly bowed and the trussrod is hard to turn clockwise. Case: Generic softcase. Don't miss this rare CSB-380 made in Japan. The strings, nut, frets and pots are consumption parts. ・ Soft Case. ◎ fret: The remaining frets are about 70-80%. The setup of a guitar base should feel easy in order to be its favorite. ◎ neck truss rod: You can adjust the neck, truss rod also has worked. This is one of the earliest Japanese made products. The stamp of Made in Japan is punched on the back of the body near the bottom end pin. Neck width at nut: approx. : 38.5 mm / 1.516 in. Scale length: 820mm/32.5 in. FERNANDES FBR-55 Medium Scale PJ Bass W/GB Free International Shipping! FERNANDES FBR-55. There is a large paint chipping on the head,Body top and Neck connection(See Photo). Can't find what you are looking for?. Sorry for your inconvenience if that is the case. 1960's YAMAHA SB-5A SAMURAI Bass Coral Red Medium Scale MIJ W/HSC FREE SHIPPING! SAMURAI Bass. 1960's YAMAHA SB-5A. Scale: 800mm. Bridge plate has been painted. Missing the Finger rest. Weight: 4.1kg. Sorry for your inconvenience if that’s the case, I hope you will get this guitar by early decision. Made in Japan in early 80s. We can send you more pictures. No buzz/dead points. The strings, nut, frets and pots are consumption parts. Don't miss this rare CSB-380 made in Japan. Case: not included. Made in Japan in early 80s. Bridge: Die-cast bridge. The neck is almost straight at present. The trussrod may be hard to turn clockwise. Frets: 70 to 80% remaining. Good condition. Color: See-thru Brown. The pickup is PJ array, so it can be switched by 3 way switch, so the sound change while playing is easy. It is a rare base that you do not see so often. [Product status]. ● Electrical system: no problem. Aria Pro II CSB-Deluxe. Weighs in at a very manageable 3.9kg's. Shiny, polished frets with a nicely oiled fretboard. Electronics are all original and fully functional. All guitars are thoroughly tested here and we'll do our best to list any known troubles in the condition section above. Used But in Nice condition.This has scratch marks (there are places where wood land is visible), scratch marks used such as back scratch marks, exhaustion of frets, deterioration of parts, rust of screws and the like. *NEW* Grass Roots / ESP G-AM-55MS BLK Medium Scale Jazz Bass W/GB Free Shipping! Weight: 3.6kg. Number of Frets: 22. Can't find what you are looking for?. Sorry for your inconvenience if that is the case. *NEW* FERNANDES FRB-45M Medium Scale PJ Bass W/GB Free International Shipping! Can't find what you are looking for?. Sorry for your inconvenience if that is the case. Bridge: BB-7. Greco BEG-105 Active Medium Scale MIJ Les Paul Bass VWH W/GB Free Shipping! MIJ Les Paul Bass. Can't find what you are looking for?. Sorry for your inconvenience if that is the case. Ready to play when you get. 1960's Teisco Fire Bird. String Height on the 12th fret: Top2.4mm/Bottom2.0mm. Ready to play when you get! Sorry for your inconvenience if that’s the case, I hope you will get this guitar by early decision. Color: LPB Lake Placid Blue. Includings : Gig bag. Truss rod : Unknown. No problem with the output and electrical system. The neck is straight. Play condition is excellent. The frets show a little wear but they are at 80% life left currently. 1984 Aria Pro II / Matsumoku TSB MIJ medium Scale Bass Free International Ship! Ready to play when you get. Unless it will be very carefully bubble wrapped and put into a cardboard box. Can't find what you are looking for?. Sorry for your inconvenience if that is the case. Fingerboard: Rosewood. Fresher PJ Bass. Plays really nicely with new strings installed, pickup combination allows for a multitude of fun sounds. This thing has a lot of charm about it with obvious 80's nostalgia, but it also has an ultra modern feel to it that fits perfectly in 2019. It is YAMAHA MB SPL of [Motion base series]. ■ Fret: about 80% remaining. The sound has a good balance of high, middle and low frequencies. In recent years, the demand has been high for bases other than long scale, and the options have increased. 1984 Aria Pro2 ZZB DELUXE. Can't find what you are looking for?. Neck is fine. Truss rod is getting close to the limit. This item is also listed for other platform. String height: Top2.5mm/Bottom2.2mm. Can't find what you are looking for?. Ready to play when you get. 1982 Aria Pro2 CSB-450 Red Cardinal Serie. Model Year: 1982. Frets: 60~70%. Finger rest has been retrofitted. Color: Red. Can't find what you are looking for?. Neck: Unknown. Neck width at nut: approx. : 38.0 mm / 1.50 in. Scale length: 820mm/32.5 in. The color is quite rare. (Most of this model have a white finish or a black finish.). This is one of the earliest Japanese made products. Electronics: Traveler Guitar Bass Headphone Amp with Aux-in. Pickguard: Tortoise Shell on Sunburst, 3-ply White on Black. Color: Sunburst. Built-in Headphone Amp. Neck Width at Nut: 44mm (1 3/4 in). Can't find what you are looking for?. Acoustic Electric Bass Fishman. Machine Head: Original. Pick Guard: None. Body: Spruce(Top)/Bolivian Rosewood(Side)/ Bolivian Rosewood(Back). Can't find what you are looking for?. NEW Ibanez AEGB10E-NT All Mahogany. Pickup: Ibanez Under Saddle. Preamp: Ibanez AEQ2T. Rosette: ABS. Body: Spruce body top/ Sapele back &side. Finish:NT (Natural High Gloss). Can't find what you are looking for?. *NEW* FERNANDES FRB-45M CAR Medium Scale PJ Bass W/GB Free International Shipp! Color:CAR（ Candy Apple Red）. Can't find what you are looking for?. Sorry for your inconvenience if that is the case. Neck: maple/walnut transmit neck. Scale: 820 mm / 32 in. Neck width at the nut: approx. 45 mm / 1.77 in. Neck profile: rather fat. The neck looks straight and the truss rod works fine. I check the Fret (String) Buzz by picking normally with light gauge strings (009-046), adjusting the bottom string height (low E) to 2.0 / 2.5 mm and the top string height (high E) to 1.8 / 2.2 mm. ·All the maintenance is done by technical staff. The neck status is Unknown. Includings : Soft Case. No problem with the output and electrical system. I will try my best to resolve the issue. This has small scratch marks or paint peeling and dent, but not obtrusive much, Nice condition. •This product is also available at Japanese EC sites. ● Electrical system: no problem. Doing that is against U.S. and international laws. Even if you think to yourself, "But the item I want is only available in Japan.". YAMAHA MBI PJ Custom was a limited upper range of the first generation of the MB series. They were made only between Oct 1987 to 1990. Neck width at nut: approx. 38.5 mm / 1.52 in. The stamp of Made in Japan is punched on the back of the body near the bottom end pin. The truss rod works as it should. Fingerboard: Rosewood 24F. Neck: maple. The neck is straight. Play condition is excellent. Includings : Soft Case. ·All the maintenance is done by technical staff. The truss rod works as it should. The neck is straight. Play condition is excellent. The frets show a little wear but they are at 80% life left currently. Includings : Soft Case. ·All the maintenance is done by technical staff. •This product is also available at Japanese EC sites. ● Electrical system: no problem. Doing that is against U.S. and international laws. Asia, Middle East. There is no gully in each part, and there is no problem in using it at all.